The cover of Oneworld’s English edition (April 2019). 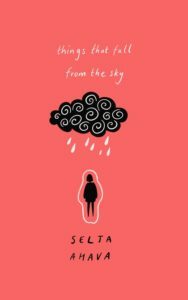 The Czech language rights of Selja Ahava’s novel Things that Fall from the Sky has been sold to Pavel Dobrovský – Beta in Prague. Czech is the 17th language area to which the rights of the title have been sold. The English edition of the title, published by Oneworld Publications in the UK, will come out in April 2019. Things that Fall from the Sky (2015) was awarded with European Union Prize for literature in 2016, and it was nominated for Finlandia Prize and the Torch-Bearer Prize in Finland. Read more about the title here. Things that Fall from the Sky is Selja Ahava’s second novel. Her first one, The Day the Whale Swam through London (2010) was a nominee for the Helsingin Sanomat Literary Prize and it won the Laura Hirvisaari Prize (the Booksellers Literary Prize). Ahava’s third novel, Before My Husband Disappears (2017) was one of the most talked-about books in Finland when it came out. Selja Ahava is published in Finland by Gummerus.